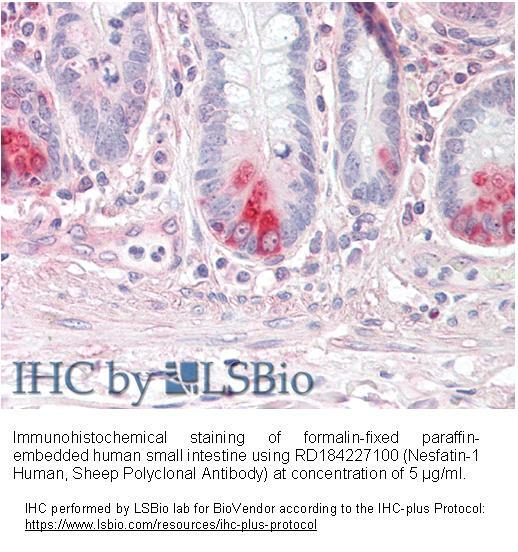 The antibody was raised in sheep by immunization with the recombinant Human Nesfatin-1. The immunization antigen (10.79 kDa) is a protein containing 92 AA of recombinant Human Nesfatin-1. N-Terminal His-tag, 10 extra AA (highlighted). Immunoaffinity chromatography on a column with immobilized recombinant Human Nesfatin-1. Nesfatin-1 was first described in 2006 as a neurohormone derived from the protein NEFA/nucleobindin2 (NUCB2). It is a polypeptide consisting of 82 amino acids, with high level of homology in human, mouse and rat. 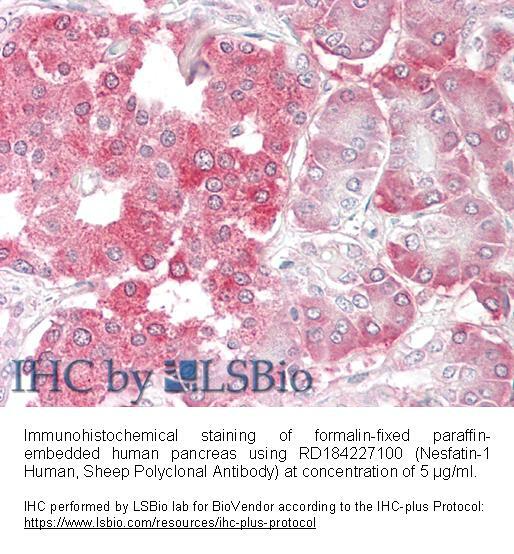 Nesfatin-1 has been localized in the brain, particulary in the nuclei of the hypothalamus, in the adipose tissue and the gastrointestinal tract, but also in serum and cerebrospinal fluid. Nesfatin-1 was identified as a satiety molecule affecting fat metabolism. Intracerebroven­tricular administration of nesfatin-1 induces decreases in food intake and body weight and increases in sympathetic nerve activity and mean arterial pressure. Effect of Nesfatin-1 is leptin – independent, it is probably mediated by melanocortin system. Several studies are currently focused on the possibility of using Nesfatin-1 in the treatment of obesity, even in individuals with leptin resistence. Due to the presence in serum Nesfatin-1 could also serve as a clinical marker in the diagnosis of many diseases. The important role of nesfatin-1 in metabolism of glucose and insulin has been reported in several studies. Different concentrations were observed in patients with diabetes mellitus type I. and II. In individuals with DM type II. postprandial concentration of nesfatin-1 was significantly lower than that of DM type I. and healthy subjects. Different levels of Nesfatin-1 was measured in patients with anorexia nervosa and panic disorders in comparison with a control healthy group. Data obtained in experiments with rat models indicate that nesfatin-1 acts as a peripheral modulator of the cardiac function. Much higher levels of serum Nesfatin-1 (up to 160×) were detected in patients with primarily diagnosed epilepsy. During the treatment with anti-epileptics concentration of Nesfatin-1 decreased, but it was still about 10 times higher that the level of the hormone in healthy individuals. It offers the idea that it would be possible to use the Nesfatin-1 as a marker for diagnosis and monitoring of epilepsy.